The Digg Reader replacement for soon-to-be defunct Google Reader is being fed to early beta invitees, offering the first look at the feed-saving RSS service. It imports nearly all of your Google Reader data, reports Gizmodo, which is testing the barebones-looking feed reader ahead of its official launch this week. Feeds carry over from the Google platform, as do categories, favorite icons and starred items. Pretty much the only thing that Digg's parent company, Betaworks, didn't dig was Google Reader's tags feature. That is missing from the Digg Reader beta. AOL clearly likes what Digg Reader is about to do for stranded Google Reader users as it's launched a RSS reader beta of its own today. It incorporates tags into a minimalist design, but the browser-based AOL Reader doesn't feature automated Google Reader importing, according to Gizmodo again. Instead, Google Reader expats will have to manually upload their OPML file and live with the fact that this beta doesn't have search functionality. While the AOL Reader beta launched today, it doesn't have a wide-open invite list compared to what Digg is said to be planning. "Due to overwhelming interest, we've added your account to our waiting list," replied AOL we when signed up for the beta. "We're activating user accounts as quickly as possible and will send you an email when your account is ready for use." 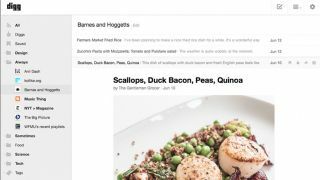 The Google Reader shut down date is July 1, meaning the Digg's offering is launching just in time for users to export their feeds from Google and safely import them to Betaworks' platform. The company also added some cross-product enhancements, with Digg items appearing on the sidebar and Instapaper integration, since it now owns that, too. Because this alternative to Google's RSS reader was quickly cobbled together, Betaworks stressed that this is a beta version that it's looking to improve upon. Digg Reader is scheduled to launch on Wednesday, June 26, giving everyone a five-day overlap between the rise of Digg Reader and demise of Google Reader.